This is one of the first few dishes I had cooked for my in-laws and the first one to earn a compliment from them. I wonder if I am the only Mum out there who feels anxious and worried every time I whipped out a meal for my in-laws. I am a very competitive person... almost a perfectionist. I don't like failure and I will get upset at myself if things don't come out the way I had planned. 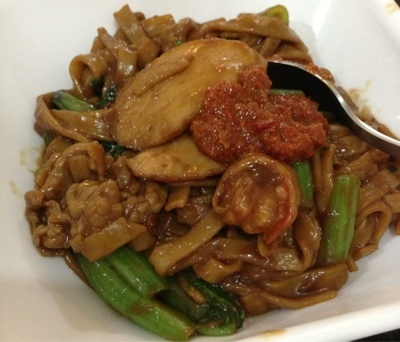 So on one fine day I decided to give this traditional Hokkien dish a try. I do not have a recipe for this, this was done from the sheer memory I had from my childhood... My Mum used to cook this for us when we were kids. Luckily this dish is simple enough for me to attempt. Ever since that attempt, I had cooked this dish most frequently and after so many attempts, I can say my noodle is very near to perfection! My parents tried it once and immediately gave me the thumbs up! The real proof of my success in this dish comes from my Husband one day when he requested me to cook this for his classmates Pot Luck Dinner :) that was indeed a very happy day for me! 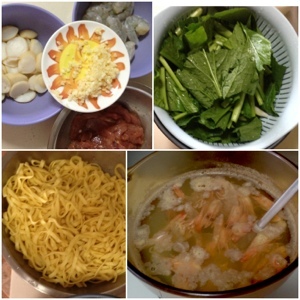 Here's my recipe for this simple one-dish-meal, this recipe is re-created from my childhood memory. Hope you like it! 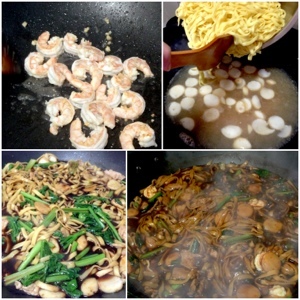 - Heat wok, add 1tbs oil and half portion of garlic, fried until fragrance then add in prawns and fried until it turn pink. Remove from wok and set aside.